With the season 2 premiere of Jamie Oliver's Food Revolution airing tonight, I thought it would be appropriate to take a look at an actual school lunch menu. 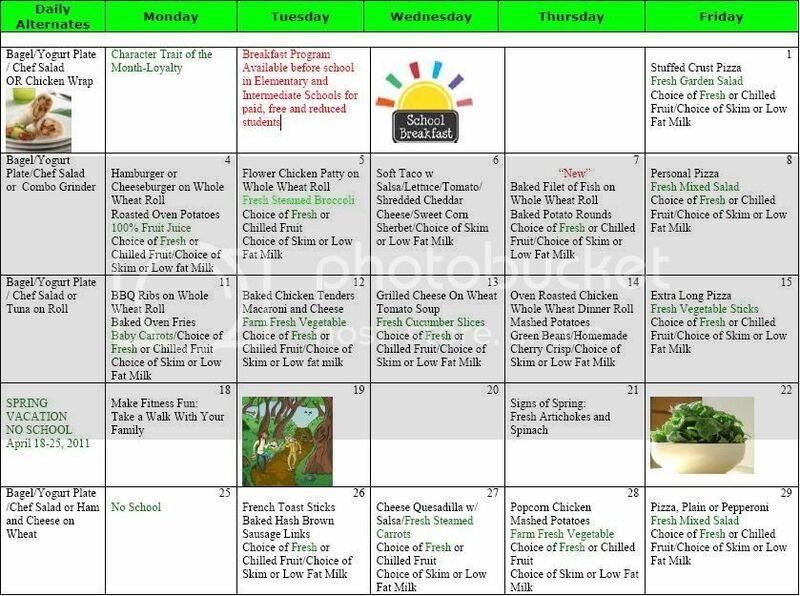 Below is the menu for our district's elementary schools her in Connecticut. Our three elementary schools house grades PreK through 3, however only grades 1 - 3 are there for lunch. This may start to include kindergarten in the future as we are hoping to have an all-day program start next year. April 1: Stuffed Crust Pizza - Frozen not fresh and highly processed. April 5: Chicken Patty on Whole Wheat Roll - Over-sized, frozen, processed chicken nugget on processed bread that just happens to be whole wheat. April 7: Baked Fillet of Fish on Whole Wheat Roll w/ Baked Potatoes Rounds - Frozen, processed fish and processed potatoes. April 11: BBQ Ribs on Whole Wheat Roll: I can't even begin to imagine what is in the BBQ sauce. HFCS is extremely likely. And they sure do like those whole wheat rolls. I could go on but I think you get my point. Now don't get me wrong, there are some great things in there. You'll notice that "Farm Fresh Veggie" is listed and that is in thanks to our Farm to School program. And they do have some kind of vegetable and fruit in there every day. But the rest of it is just processed junk. If you took all of these and made them fresh then there would be no issue. However the fact of the matter is that schools in the United States are buying boxes upon boxes of processed foods and that is what they are feeding our kids. Here is an even scarier image, at least for me. Underneath the school menu on our's school site it listed something for "Visual Lunch Menu". I had no idea what that meant so I clicked on it to see. Basically it is the menu but with a picture to accompany the description. I'll let you take a look for yourself. Aside from the salads and vegetables mixed in there, the rest of it looks like a menu at a fast food restaurant! How many variations of breaded, processed chicken can we have? Chicken patty, chicken tenders, popcorn chicken... enough already! Just because it says "baked" does not mean it is healthy. It is one thing to occasionally eat the processed meal, we do it too. But to have your kids eating this stuff day after day is not healthy. I currently have three children at the elementary school: two in PreK and one in Kindergarten. Right now they do not even eat lunch at school, just a snack, but starting next year my oldest will. As it stands right now I will NEVER have my kids purchase the school lunches, even though we most likely qualify for a discount. Sure I'll be the crazy strict parent who sends in the PB&J, fresh fruit salad and diced cucumber with humus, but I am OK with that. I hope to start experimenting with bento style lunches to keep it interesting, we shall see. OK, enough with my ranting, I want to know what YOU think. Are the school lunches in your area similar to ours? Worse? Better? What kind of lunches do you send to school for your kids? Talk to me! It looks exactly like our lunches. My kids only eat the pizza as a rule. Also if they have pizza for lunch they have also had it for breakfast, only ya know with sausage and an egg scrambled on it to make it breakfast pizza. Compared to what they're actually getting the pictures in the menu look delicious. School Lunches are never going to change unless we do something about it or pack our kids lunches. I'm not sure what it's like in your state but once they reach the High School level here they get more "healthy" choices but they're also much more expensive! That's MUCH better than our school lunches. I pack my kids lunch because it's far healthier than what they'll buy at school. Breaded chicken nuggets, breaded chicken patty's, nachos and taco meat, bean burrito. Some days they'll get a choice of fruit or carrot sticks with their meal, it's awful! I'd rather send my kids with a whole grain turkey sandwich with provalone cheese, baby carrots, low fat yougurt and they get 1 bad snack like crackers, or chips or a cookie as well as a piece of fruit and flavored water. @Gina - I'm with you. I definitely will be sending lunches in. Its upsetting that by throwing some carrot sticks out there they think that is enough healthy stuff. Ugh. @Little - You are absolutely right, nothing will change unless we make them change. Right now I feel very much alone though, so many people seem to care. Or perhaps they just don't realize how bad this "food" is for you. Wow, yours are pretty healthy - ours not so much.